Hundreds of young arrow cichlids (Amphilophus zaliosus) are only perhaps sixty days from hatching. Although they have been abandoned by their parents, they continue to school at a nesting site. Photo by Martin Cabrera. 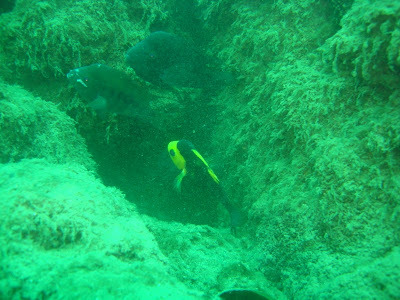 We often get asked what can be seen while SCUBA diving in Laguna de Apoyo. Nicaragua has lots of lakes and rives, but most tropical freshwater sites here and elsewhere have low visibility. 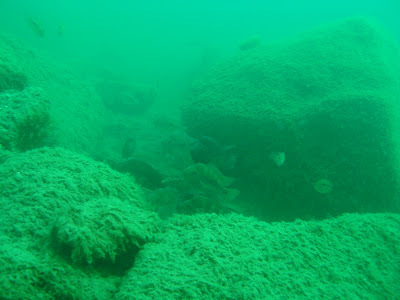 Lake Apoyo visibility is almost always 5-12 meters at the locations where we dive. The fish of Lake Apoyo are special, too. The most commonly seen fish are members of the Midas cichlid species complex. Six species in this group have been discovered in Lake Apoyo, all of which evolved in the lake and inhabit only this lake. The first to be discovered was the arrow cichlid (Amphilophus zaliosus) in 1976 by a professor at University of California-Berkeley, George W. Barlow. Most of these six endemic species can be seen while scuba diving. Arrow cichlids, like all the other members of the Midas cichlid species complex in Lake Apoyo, nest in rocky reefs, but they also nest often over sandy bottoms in water from 4 to 8 m depth. All the fish in this species complex, which is found throughout the San Juan River watershed and a few rivers to the north and south, provide parental care to their fry for several weeks after hatching. Here is a photo of the arrow cichlid fry after the parents have abandoned them. These fish are no longer defended from predation by the parental units. These arrow cichlids have not yet dispersed but are no longer receiving parental care. Photo by Martin Cabrera. The parental units expend a lot of energy during the seven weeks of care of the fry. Predators constantly attempt to capture the small fish and they are fended off by the parental units. It's a long seven weeks, not including the courtship and egg-incubation. Parental units often look battered and even emaciated at the end of the period of parental care. However, the great majority of nests never make it to seven weeks fry age, because predation and disease will have killed of the entirety of their nests. After a scuba dive in Laguna de Apoyo, the clearest lake in Nicaragua. Photo by Martin Cabrera. Lake Apoyo is the easiest of all locations for scuba diving in Nicaragua. We are located only one hour from downtown Managua. Estacion Biologica collects data at four sites in Laguna de Apoyo, all have easy reach from the shore, and great views below. We enter our study areas from the shore, along property managed by Estacion Biologica. Life is good after a dive. Photo by Martin Cabrera. One vital reason for our monitoring program is the bigmouth sleeper, Gobiomorus dormitor. This fish looks a lot like a goby, only much larger as an adult. This voracious predator sits quietly on the lake bottom, where it awaits an injudicious move by any appropriately sized fish, when it strikes with lightning speed. The fish of Lake Apoyo spent thousands of years without the threat of bigmouth sleepers or anything similar, so they are now evolutionarily naive to the grave threats this fish presents. The Bigmouth Sleeper (Gobiomorus dormitor) is a dangerous predator. It was introduced into Lake Apoyo in 1991. Photo by Martin Cabrera. 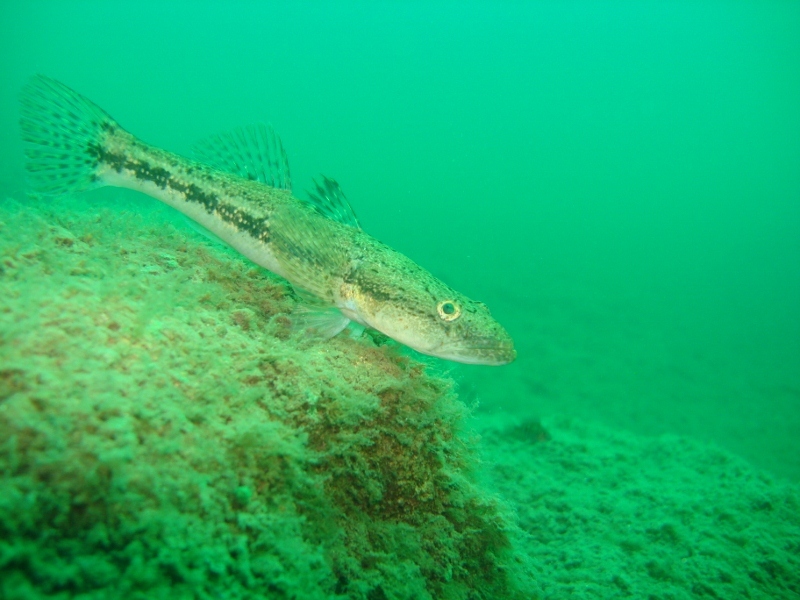 Bright blotches, usually randomly placed, are not exactly uncommon among fish. These colors are usually caused by a specific mutation, such as in the goldfish, which is simply a selectively bred variant of a wild carp. Midas cichlids have a similarly brightly colored variation in the wild, although the "golds" are much more common in some locations than in others. Lake Apoyo, for instance, is considered to have no gold forms. 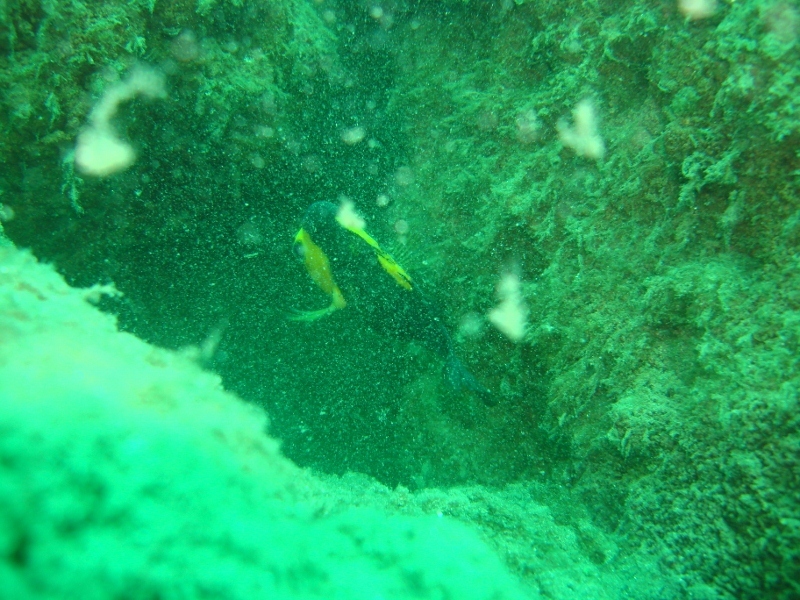 Nonetheless, as the photo below demonstrates, gold forms may also be found in Lake Apoyo. Gold form Midas cichlids are relatively common in some lakes, but not in Lake Apoyo. Fish such as the one in this photo are exceedingly rare. Photo by Martin Cabrera. Which gene(s) control the gold color form in the Midas cichlids is not known. Nor does anyone understand why Lake Apoyo has so few golds. In comparison to most other natural habitats of the Midas cichlids, Lake Apoyo has far fewer golds. 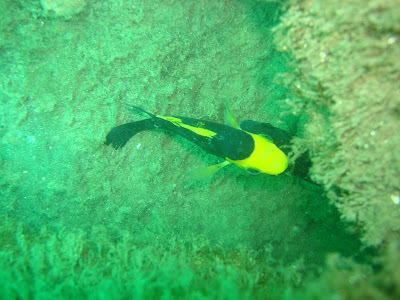 This clownish coloration is quite common among Midas cichlids in Lake Managua, some parts of Lake Nicaragua, and other volcanic crater lakes such as Lake Masaya and Lake Xiloa. 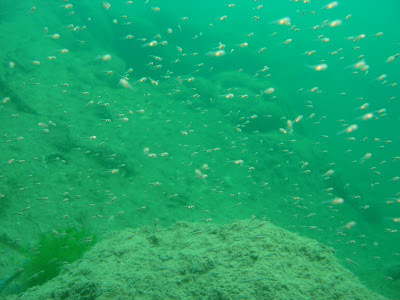 Why is it so rare in Lake Apoyo? We don't know. This breeding, gold form Midas cichlid stays near the nesting hole. Photo by Martin Cabrera. 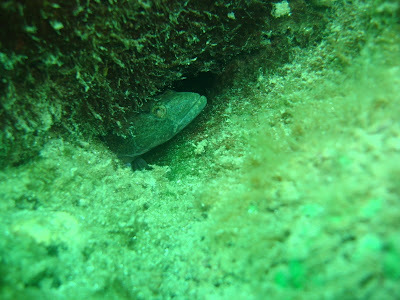 Midas cichlids are territorial when nesting. 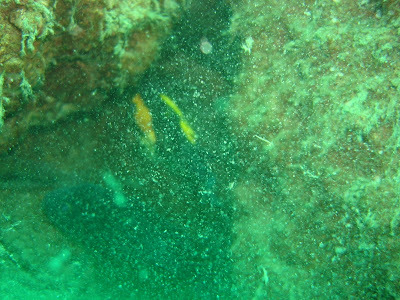 A breeding pair will occupy a natural or constructed hole, often at the base of rocks, in which a hard, flat, usually vertical surface can be utilized to adhere eggs. The pair will defend the site vigorously against predators and usurpers. The gold-normal breeding pair linger near the nesting cavity. Photo by Martin Cabrera. 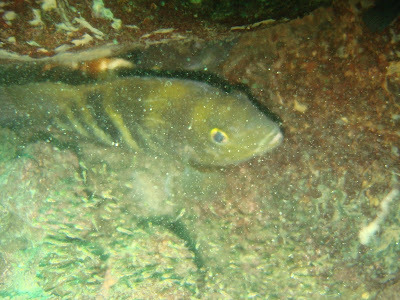 The great majority of Midas cichlid nests do not result in the eventual creation of new adults. 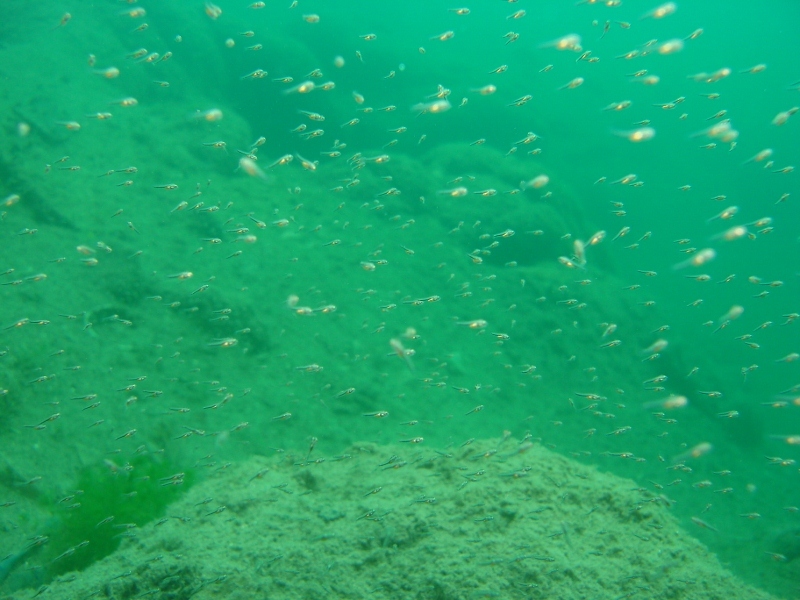 Hundreds of eggs are produced in each spawning, but very few fry will reach the age to swim away from the parental units and begin life independently of them. The Bigmouth Sleeper has occupied Lake Apoyo only two decades, but is now very common. Photo by Martin Cabrera. The newest reason for the demise of nests in Lake Apoyo, the bigmouth sleeper, has become very common in the lake. Some of the Midas cichlid species of Lake Apoyo are so rare that the bigmouth sleeper could even make the species disappear. Who would even know if a fish species in Lake Apoyo went extinct? Filamentous algae forms a carpet on the lake bottom where Chara macroalgae was once abundant, placing much of the life in the lake at risk. Photo by Martin Cabrera. The bigmouth sleeper has a neutrally colored, mottled pattern along its sides and back, making its detection difficult. It sits on the bottom, awaiting a false move by some other fish. It strikes rapidly, with the intention to sink its long, fine teeth into the prey and then gradually move the prey into the mouth to swallow it. 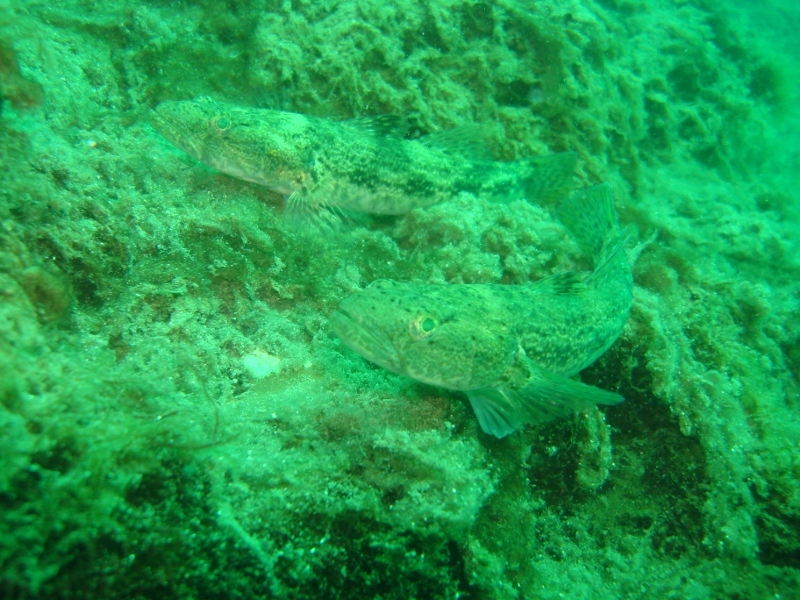 A Bigmouth Sleeper (Gobiomorus dormitor) pair in courtship in Laguna de Apoyo. Photo by Martin Cabrera. The success of bigmouth sleeper (Gobiomorus dormitor) during the two decades of its time in Lake Apoyo is startling. They are extremely common. Recent research conducted by Topi Lehtonen and the research team at FUNDECI/GAIA demonstrated that the Midas cichlids of Lake Apoyo do not recognize the threat these fish present to their fry. These Midas cichlid fry must share their nest space with garbage left by humans. Photo by Martin Cabrera. Lake Apoyo's fish species are facing several threats from humans. Soil introduction into the lake is higher than ever, coming from constructions in the watershed. Predation and loss of habitat by introduced species have done lots of damage to the species found here. And of course, garbage follows humans everywhere we go. 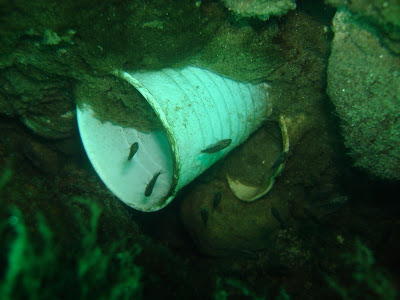 The fish of Lake Apoyo have no choice but to utilize garbage-filled areas of the lake to feed and reproduce. Juvenile Amphilophus cichlids in Lake Apoyo, Nicaragua. Photo by Martin Cabrera. 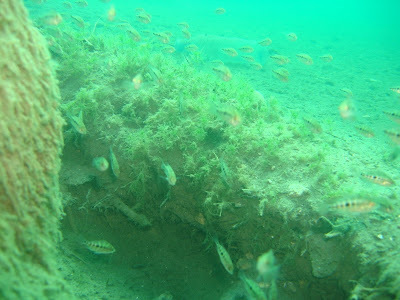 Lots of juvenile Midas cichlids are present year-round in Lake Apoyo. By diving during the different seasons, one can see the smaller fish grow and, by the end of about a year, start their first anniversary as members of the next breeding stock. 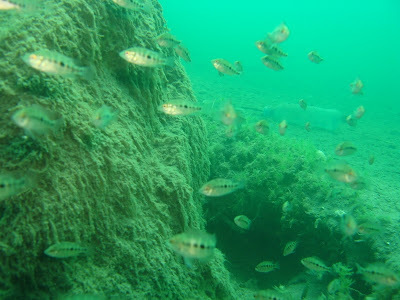 The intense uses (and misuses) of Lake Apoyo by human beings requires that we assure adequate habitat for these fishes in all their life stages. 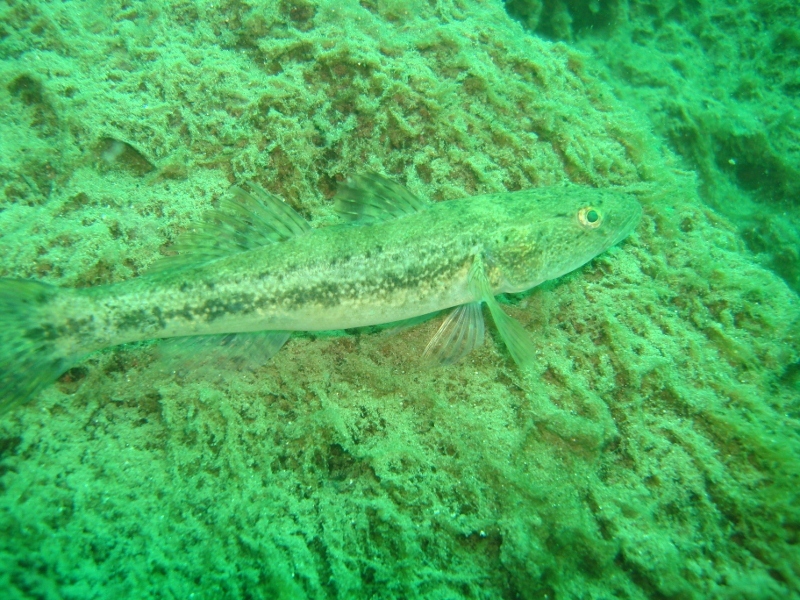 A blind Amphilophus astorquii in Lake Apoyo, Nicaragua. Photo by Martin Cabrera. To date, six species of the Midas cichlid species complex have been described in Lake Apoyo. All of them are only found in this lake. 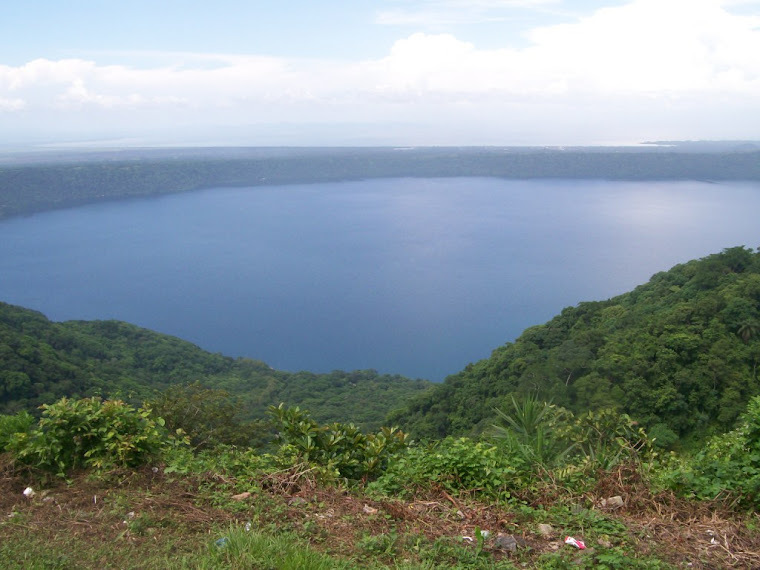 There are eight volcanic crater lakes such as Lake Apoyo, near the Nicaraguan Great Lakes, which have multiple species of Midas cichlids in them. What was once thought to be only one or a few species is now considered to be dozens of species, with very small ranges, and in some cases, populations of only a few thousands of adults. 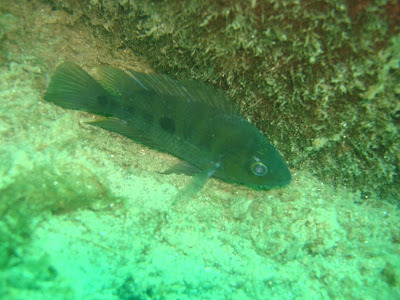 One of those species with a very small population is the chancho cichlid, Amphilophus chancho. It is the largest of the Midas cichlid species complex found in Lake Apoyo, with males sometimes reaching well over a kilogram weight. 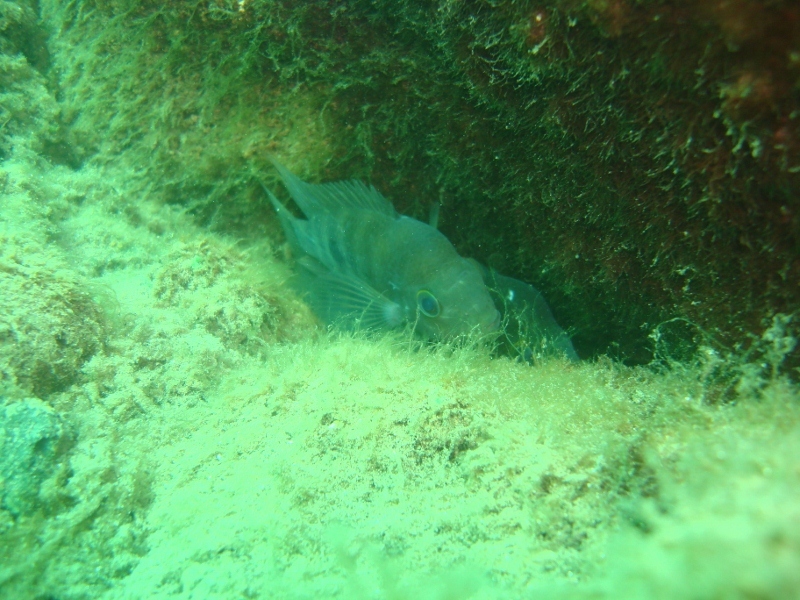 Amphilophus chancho defending fry in a nesting hole in Lake Apoyo. Photo by Martin Cabrera. Child-rearing is an expensive venture for most species. It is especially so for the Midas cichlid species of Lake Apoyo, too. Providing care for the fry means eating less and lower quality food. It also means getting in harm's way. The parental units must confront potential predators and utilize displays, threats, and if nothing else works, direct attacks to drive away the fish and crabs that would want to eat the fry. Adults often look emaciated and battered at the end of the breeding season. Amphilophus fishes near a hole beneath a rock in Lake Apoyo, Nicaragua. Photo by Martin Cabrera. A scuba dive with the staff at FUNDECI/GAIA usually means seeing most of the six species of the Midas cichlid species complex, perhaps about five hundred individuals in total. Occasionally, we get to see jaguar cichlids (Parachromis managuensis) up close, while nesting. It also means seeing the ubiquitous bigmouth sleeper, lots of them, perhaps upward of a hundred individuals in a single dive. Other fish, crabs, and the dramatic undwater views round out most dives. Some of the dives take you to thermal vents, where clear, warm water flows from between rocks into the lake. And especially during the appropriate season (November through February), lots of fry in nests! 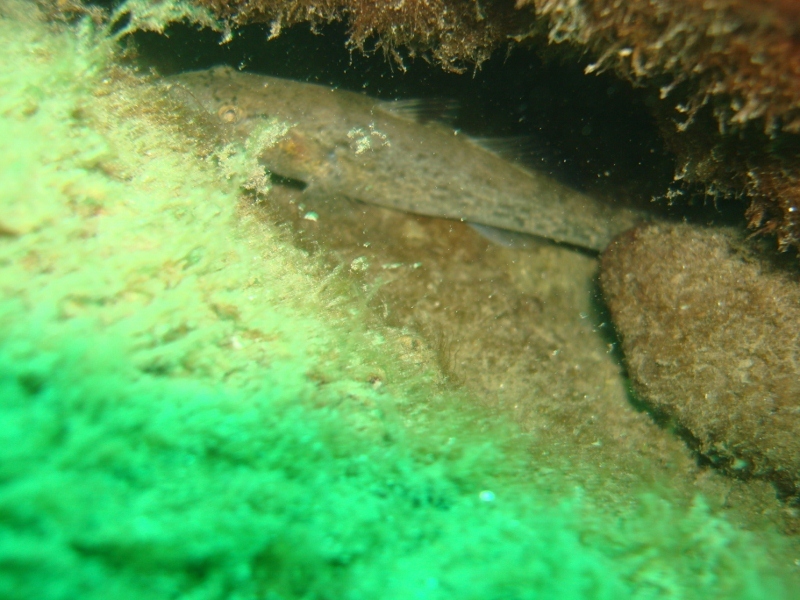 An adult bigmouth sleeper uses a hole beneath a rock as a hiding spot, from which to hunt. Photo by Martin Cabrera. 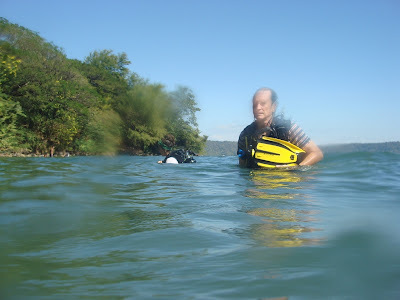 Diving in Lake Apoyo is different than in the ocean and generally much easier. No currents, waves, poisonous animals produce dangers here. The dives are rewarding and especially so when contemplating the rarity of some of the fishes, to which our divers contribute to study and protect them. 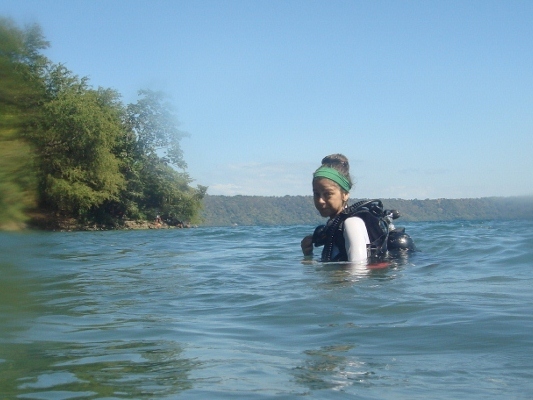 Please contact us if you would like to dive with us in Lake Apoyo. Jaguar cichlid (Parachromis managuensis) fry are feeding in open water outside their nest cavity in Lake Apoyo, Nicaragua. A small clump of Chara vegetation can be seen in the lower left. 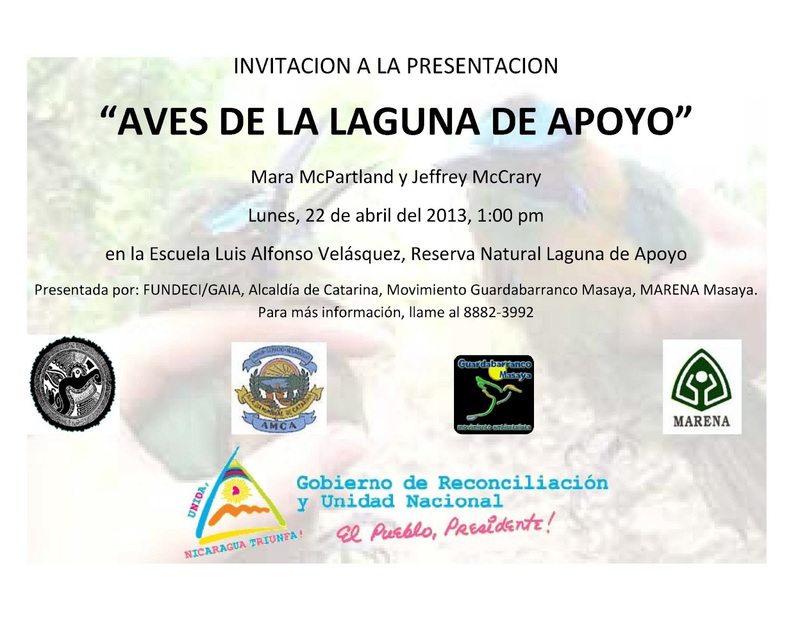 Over 225 species of birds have been documented in Laguna de Apoyo Nature Reserve in Nicaragua. Not all birds are found just anywhere, of course, because of differences in the natural habitat, and because of differences in human impact in the environment. FUNDECI/GAIA has conducted a systematic study of the variation in the bird communities according to land use in five different sites in Laguna de Apoyo Nature Reserve. Mara McPartland, an ecologist from the United States who is on a conservation science internship at FUNDECI/GAIA, will present how land use affects the bird communities. Birds are excellent indicators of forest quality, as is shown by the results of this study. The presentation will be held at the local elementary school, "Escuela Luis Alfonso Velasquez", just 200 meter from Estacion Biologica. The public is invited, to the presentation and discussion, and refreshments will be served afterward. Whether you are a scientist or conservation professional, birdwatcher or nature lover, or simply an interested person, you are invited.